how are you? Do you know Logona White Kaolin Lotus Flower Cleansing Gel? What do you think about it?.It has white kaolin (clay) and suppose to be good for cleaning the skin and the hair. I have just bought it because I have problem with very oily scalp. Basically I need to wash my hair everyday which is sometimes frustrating, especially now during winter. I have no time to wash my hair in the morning and I don't want to use a hair drier either so I wash the hair in the evening. But the following morning my hair is only "semi fresh". 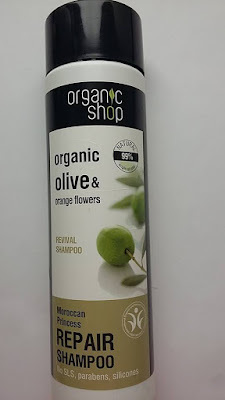 I have tried many things to prolong the freshness of the hair: different shampoos, skipping conditioner, different diets ( I would like to write a long post about later) etc. but it hasn't really changed anything. Yesterday I bought this and I have used it already once and to my surprise it made my kind of dirty. I mean it left the hair covered with some kind of oily film? I don't know if I have done something wrong? I mean I have washed the hair twice, I have rinsed it really well and I have even skipped the conditioner because I didn't want that something else would interfere with this clay. I forgot to mention that this has really good and few ingredients (Aqua (Water), Kaolin, Montmorillonite, Parfum (Essential Oils), Nelumbo Nucifera Extract, Limonene) and less is more in his case:). What do you think? Have you had any experience with this product or kaolin in general? I would be glad if you could share it with me. Thank you for reading.